Harley-Davidson will pay about 70 million euros ($111 million Cdn) for the MV Agusta Group. The deal was announced this morning. 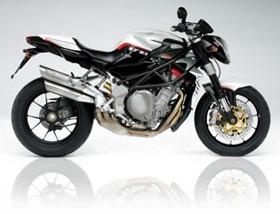 The purchase will bring into the Harley family two lines of motorcycles: MV Agusta with its exotic high-perf F4-R and the 1078 Brutale RR, and Cagiva with a line of lightweight street bikes. The deal is expected to close in a couple of weeks, and will include paying-off a 45-million euro debt for the MV Agusta Group, and a future payment to Group owner Claudio Castiglioni, in 2016, if certain financial goals are achieved. Harley-Davidson will run MV Agusta from the Italian group’s home in Varese and will start things off by setting up a new team of leaders to resume manufacture of current models. MV Agusta production had slowed because of money problems. Castiglioni, whose family owned most of the Group shares, will stay on as chairman and he and design chief Massimo Tamburini will continue to direct motorcycle development. "We take enormous pride in MV Agusta and Cagiva motorcycles," said Castiglioni. "Our riders seek an uncompromising experience in premium performance motorcycles. And with Harley-Davidson’s deep understanding of the emotional as well as the business side of motorcycling, I have great confidence that our motorcycles will excite customers for generations to come." As one who’never entered a HD dealership and plans to to NEVER be so old to want to ride one of those things, here’s an idea. HD’s customers are old. HD needs to connect with a different market. Agustas are expensive, but someone who wants one doesn’t care if it’s sitting on the showroom floor, they just want local dealer service. And the fringed-leather beanie-helmet crowd who are HD’s market might be “put off” by a MV Brutale sitting next to the Fat Bob. So HD could use its huge dealer network to service MV’s in North America and sells them, essentially on a sepecial order basis. MV is pretty much irrelevant so why worry about what H-D will to them. MV’s situation can only improve. But perhaps the real reason is to use the MV dealer network in Europe (if one exists) to expand Harley sales in Europe. H-D has to reach a younger audience one day. Lord knows Buell hasn’t done much for them in the last decade. As tough as it’s been for H-D dealers to sell Buells I doubt we’ll see any combined H-D/Buell/MV Agusta/Cagiva dealerships. But…a Buell-badged Mito 525 anyone? Cagiva powered Sportster anyone ??? It will be interesting, for sure. If brand identity can be maintained, there’s a chance this could work out well for everyone. If they re-brand the MVs as HDs – as they did w/ Aermacchi – then I believe that history will repeat. Will HD boutiques now provide space for MV *AND* Buell? Will HD wrenches get “cross trained”? How’s that Buell service working out? Oh good, highway pegs for the F4, should make this a more comfortable touring bike! Shades of HD and Aeramacchi in the 70s !